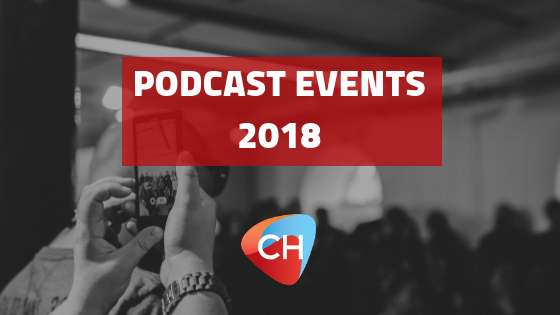 Podcast Events 2018 - A worldwide list of podcasting events this year. Last year we went to as many as we could and… The experiences we had, knowledge we learned, and people we met was simply amazing. One thing we found is that there aren’t exhaustive lists of all the events, and even when writing this we discovered so many that we didn’t know existed. So here is our list of the podcast events of 2018, we have not attended most of these… Therefore in the interest of fairness we have simply listed them in date order, with links. Please do let us know in the comments if we have missed any podcast events. Or do get in touch if you would like us to add your podcasting event. If you have attended any of the events above, please do let us know about your experience in the comments below. We would love to hear your recommendations. Thanks Felix 🙂 I have now added it to this list. Do you run the awards? Awesome Nicki thanks!! 😀 Will check out the podcast. We were at the ARIAs too, we were lucky enough to get a nomination, it was a great night! Thanks Sophie will check it out and add it to the list 🙂 Do you organise the event? Would love to hear more about it! Awesome list. Thanks for posting. Thanks for including the New Media Summit!